We have been here before, riding the ups and downs of Alaska’s roller-coaster economy. Three times in the past 40 years, our economy has tanked, responding to the downward pressure of falling oil prices, drops in state revenue and consequent cuts in state employment. Instability is harmful and leaves lasting scars on the lives of people affected. It behooves Alaska’s leaders to work toward economic stability. We are entering the era that they foresaw. Last year, the Legislature adopted Senate Bill 26, creating a percent-of-market-value, or POMV, endowment system for sustainable annual draws from the Earnings Reserve Account, the spendable part of the Permanent Fund. This year, $2.9 billion will be available from POMV for state purposes. Petroleum revenue is still significant, contributing about $2 billion to the state’s coffers this year. Unfortunately, even with the new POMV source, Alaska faces a current deficit of about $1.6 billion. Also, this Legislature must grapple with the size of the Permanent Fund dividend, dubbed “the elephant in the room” by Senate Finance Committee Chairwoman Natasha von Imhof. Gov. Mike Dunleavy’s stated intent is to pay a dividend of $3,000 per person this year, with additional supersized dividends in the two following years. Assuming each of Alaska’s 615,000 qualified dividend applicants receives $3,000, we are talking about a state expenditure of $1,848,000,000 this year alone – quite a sizable elephant! Our new governor proposes to cut his way out of the deficit problem. We can expect public response to be both loud and mixed. Obviously, the supersized dividends have wide public appeal, but their size threatens the sustainability of the dividend program itself. Cuts affect programs people want and need, and heavy-handed cutting could plunge the state’s teetering economy into a severe recession. With more of a rumpus than a clear public mandate, legislators must study, learn and think independently as statesmen and stateswomen, and work across the aisle. This year, the Legislature needs to complete that job. Last year’s bill omitted the politically charged question of how to split the POMV allocation between dividend payments and other governmental costs. This omission leaves the dividend vulnerable to political manipulation or even deletion. 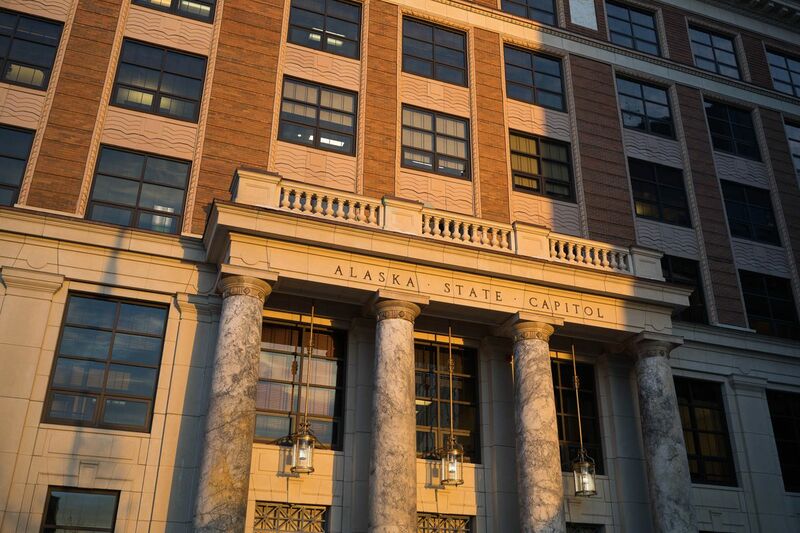 By correcting the omission in SB 26 early in the first regular session, the Legislature would take the dividend out of the political arena and give this uniquely Alaskan program the stability and predictability that it merits. In turn, a stable dividend would help stabilize Alaska’s economy. The start of a new legislative session is also a good time to look at a structure for the broad-based tax that many Alaskans recognize as a necessary component of a stable economy. In the early days of statehood, Alaska had a very simple income tax that did not require an army of accountants and several years to implement. The individual taxpayer looked at his federal tax return and figured his state obligation as a percentage of the total amount due to the IRS. Adopting a structure would be a first step. The actual percentage could be established and adjusted as needed. Alaska Common Ground invites you to a public forum on “The Costs of Alaska’s Economic Roller coaster” on Jan. 27 from 4 p.m. to 6 p.m. at the 49th State Brewing Co. in Anchorage. A panel of community leaders and ISER economist Mouhcine Guettabi will present their different perspectives on the costs of instability, possible solutions and their vision of Alaska’s future. Do join us and ask questions. Alaska Common Ground forums are free, and everybody is welcome and encouraged to attend.